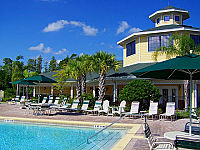 Located just minutes from Disney parks, Caribe Cove Resort Orlando is your treasured home away from home, nestled in a quiet corner of Orlando's lush tropical landscape of fun and entertainment. Choose from luxurious two- and three-bedroom villas, and enjoy the spacious accommodations with the entire family or indulge in a private romantic getaway for two. Your vacation is waiting. Reserve your private Villa today at Caribe Cove Resort Orlando and experience the best of Orlando!